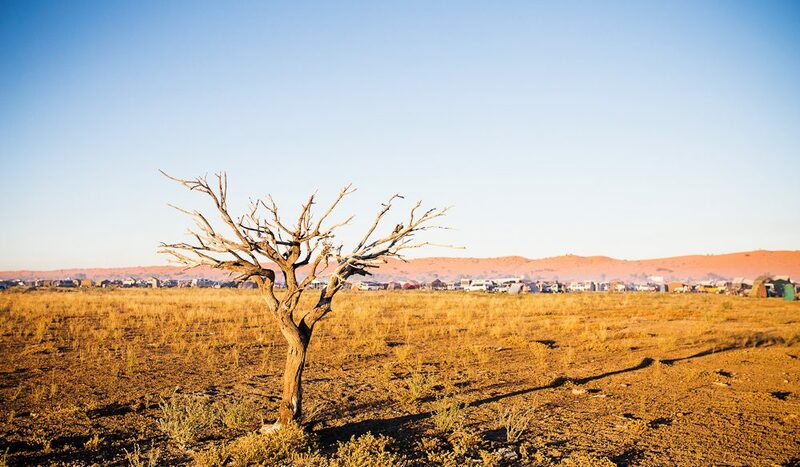 The Big Red Bash’s tent city beyond a typically gnarled tree (photo: Benjamin Knight). 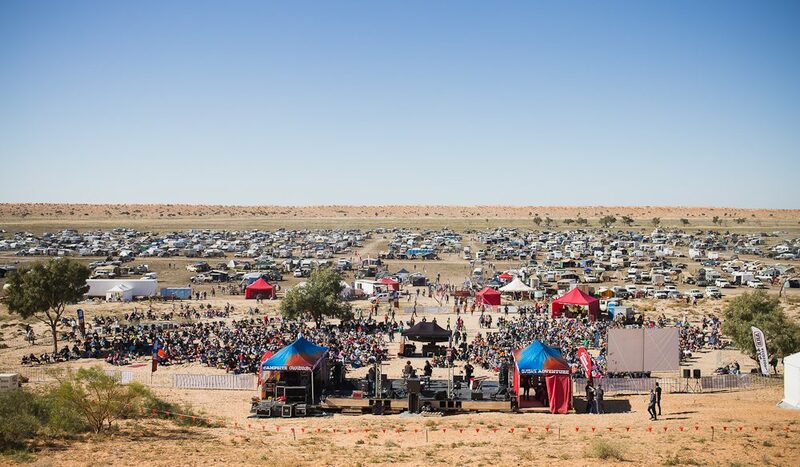 The Big Red Bash is an eccentric, rock-fuelled Australian outback pilgrimage like no other. 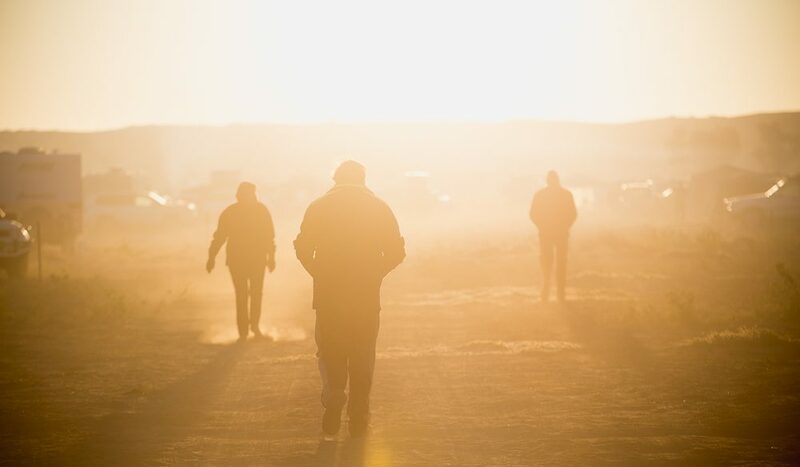 Steve Madgwick heads past Birdsville, to the edge of the Simpson Desert, to the world’s most remote rock concert. (Photography Benjamin Knight). The word ‘only’ ceases to mean what city people think it means at some indistinct point in the outback. “That’s not an only,” I say. But Brian insists that it’s no big deal. He only broke one water pump on the ’Cruiser and only had one flat en route to the three-night Big Red Bash, possibly the most remote music festival on earth. Apparently the tiny iconic blip of Birdsville (only 1600 kilometres from Brisbane or an intrepid 1200 kilometres from Adelaide) was not far-flung enough for the festival’s organiser. 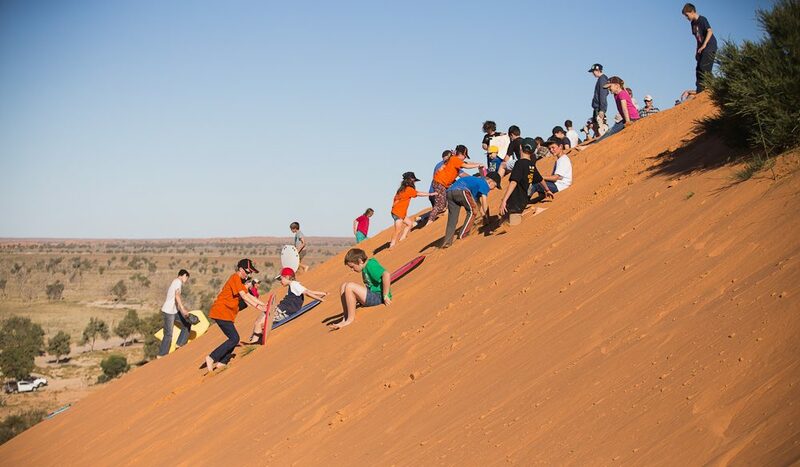 Once you reach Birdsville’s classic Australian watering hole, in a corner of the Queensland outback, there are still 35 unsealed kilometres before you reach the (only) 40-metre-high Big Red dune on the Simpson’s edge, the site of the all-star charity concert. All-star, that is, in a classic Australian rock ’n’ roll context. Country-pop-rock trio The McClymonts pump up the afternoon tempo. Their songs pulse out from the open-air stage, float up the natural amphitheatre of the sand dune behind, and resonate hundreds of metres across the dry lake bed in front to the crowd. The good oil from punters is that 3000 people will make the Big Bash pilgrimage this year – there were only 2000 last time. Every single person seems to have brought a camp chair along with them (except me), with one esky per family the norm. Like Germans at a Club Med resort, people mark prime positions in the corralled sandy space in front of the stage with their chairs. The low steel barriers feel alien and unnecessary in this expansive space. It’s a long way to drive to sneak into a concert. And, anyway, you can see and hear it for kilometres around. Fashion on the field is a marriage of practical multipurpose-ware (at home for work and play) with intensely personal splashes of flamboyance. 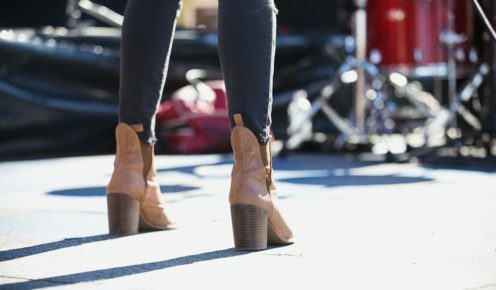 Comfortable is the new shade of black at the Bash: big hats and boots are in, as is denim, double-denim and warm flannos. As dusk envelops the burgeoning campground beyond the stage, heavily laden 4WDs piloted by self-sufficient souls collectively, instinctively mutate into a rather orderly Wild West city. From up above on Big Red, the self-illuminating grid pattern is easily mistaken for a regional town. It’s only 1ºC as I wrestle into my dome tent. I only put on one extra layer of clothing inside my extra-warm sleeping bag. Big Red Bash town swells further on day two. And, shoot, are the new arrivals playful. Kids on boogie boards (now that’s forethought) or on mum and dad’s pilfered esky lids slide head first down the steep dune seemingly on a collision course with musicians. Others simply practise full somersaults with a forgiving sandy landing. 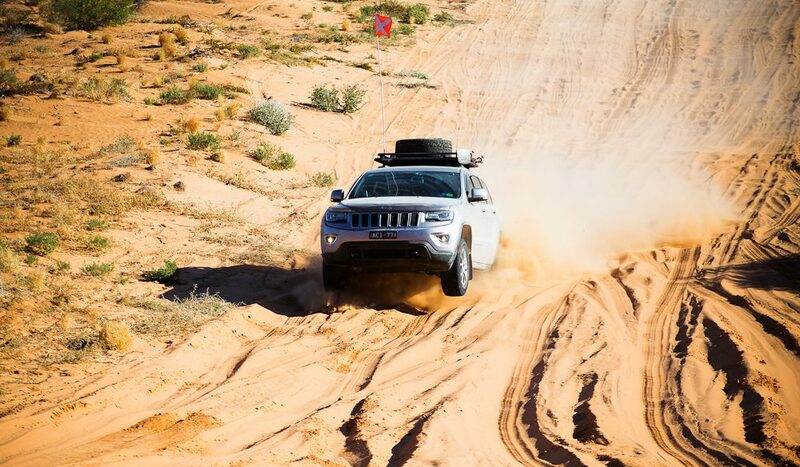 On the other side of Big Red, dads and mums play on their own, in obsessively accessorised Toyotas and Jeeps, seeing how far their pride-and-joys can climb up the dune before it spits them back down. A few follow tyre tracks in the opposite direction, away from the hubbub, to the next dune, Simpson-bound. Not music fans, I guess. A quick roll back down the Big Red and past the stage lands me at a pop-up wood-fired pizza trailer where there’s a four-deep line, a serious compliment given just about every person here has lugged copious food and cooking facilities with them. A few other country-fete-standard food options are decent enough without strolling into gourmet territory, while the coffee van offers a Big-City-quality cup of pep-me-up – and gets serious attention day and night. Miss Gypsy White Moon is on a break from a hard day’s fortune telling outside her suitably retro caravan. Break over, another customer (male) walks into her trailer looking for direction among the tarot cards. In the backblocks of Big Red town, I randomly bump into Alison Stephens, women’s winner and third overall in the Big Red Run – a desert ultra-marathon held just before the Bash. 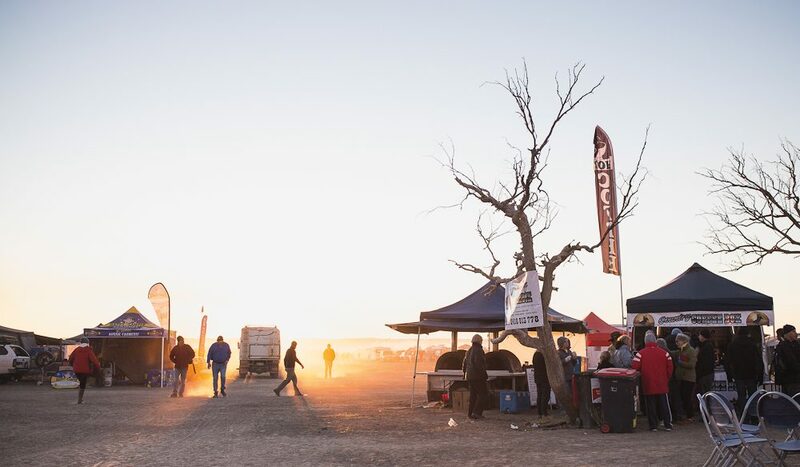 The charity race (not to be confused with a medieval punishment) starts in Birdsville town and winds its way through clay flats, salt lakes and shifting dunes. No big deal, really; entrants only run five marathons in six days in the shade-less Channel Country. Alison relaxes with her family around the campsite, but is adamant she’s going to let her hair down at the concert finale tonight, before the five-day drive back home. Except for her desert-baked sunglass tan, there is no other visible clue that this woman just ran 250 kilometres a few days ago. The bass follows me as I wander further away from the stage, past a burlesque mannequin with a flowing scarf, latched upright on top of a Land Rover, Priscilla-style. The private station reveals its true, dry essence as the camper trailers thin out: lifeless trees frozen in time, the pelt of a decaying cow lies on the cracked brown earth. Past the edge of this temporary civilisation, Dave the Camel Man relaxes after a brisk day’s business. 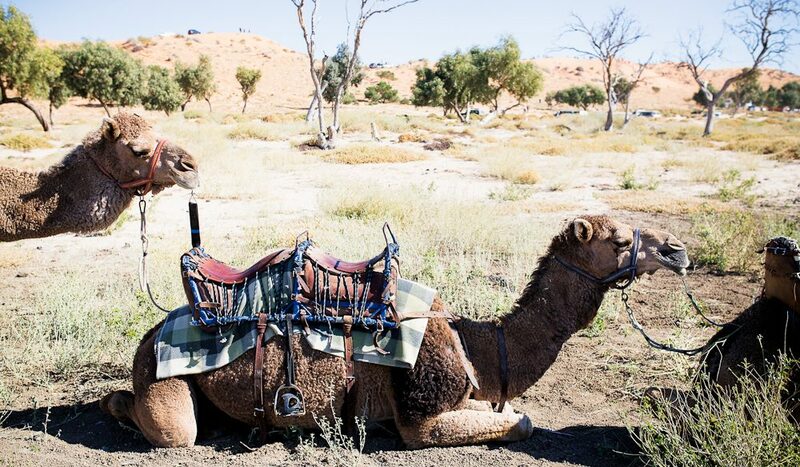 Dave reckons he’s no good at the business side of camel rides, even though he and they have been flat out all day taking Bashers on dune rides (at $50 for half-an-hour). “Like a drink?” he says. It’s more statement than question. I take a sip. My eyes tear up from a pannikin full of rum with a tease of cola. Dave’s backstory unfolds as we hear the big acts begin across the dusky distance: Jon Stevens and Diesel. He says he’ll wander over for a closer look when headliner Barnesy comes on later. Dave once dreamed to see every inch of Australia, but love threw him off course. That didn’t exactly go to plan either and, well, here he is. As the light fades the ‘Vivid-style light show’ that accompanies the on-stage stars feels like it would make way more sense somewhere where the Milky Way doesn’t show its wares so spectacularly. We muse over why 3000 souls are drawn into the outback in winter, especially when you can see many of these rock icons in your (far more convenient) local RSL club, if you wait long enough. The Bash is not really about who plays, Dave says sagely; doesn’t matter whether it’s Barnesy, Farnesy or insert any other Australian music legend you care to name. We cheers to that. It’s funny, but not once do I hear the word ‘only’ fall from Dave’s mouth. Playing there: The Big Red Bash 2016 runs from 4–6 July. The line-up includes Paul Kelly and Jimmy Barnes, with proceeds going towards diabetes charity JDRF. Getting there: See Outback Loop and Outback Queensland for more information on the big drive to Birdsville. For flights, see Regional Express. 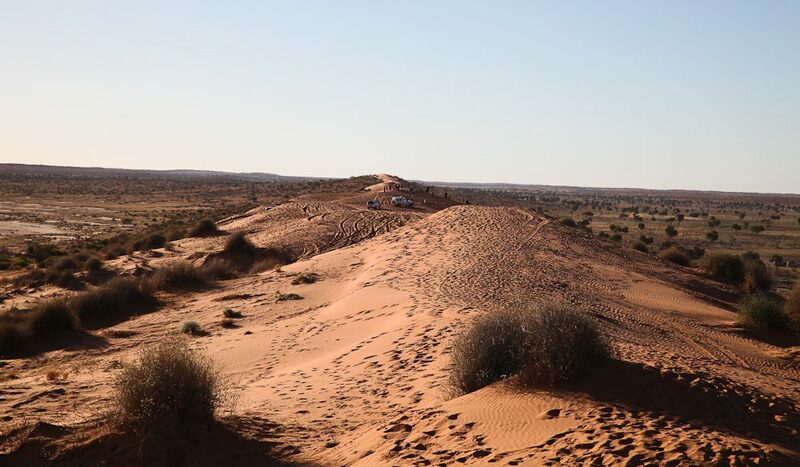 Desert Edge Tours offers transfers in its huge, dune-munching 4WD-bus hybrid from Birdsville.